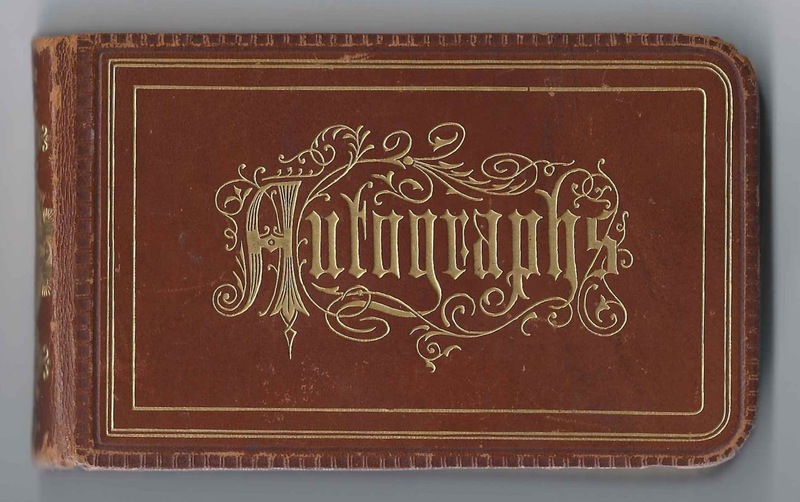 1878-1882 autograph album of Eliza Knight (Hamlin) King of Sweden, Maine. She was the daughter of John and Caroline (Evans) Hamlin and wife of William Horatio King. 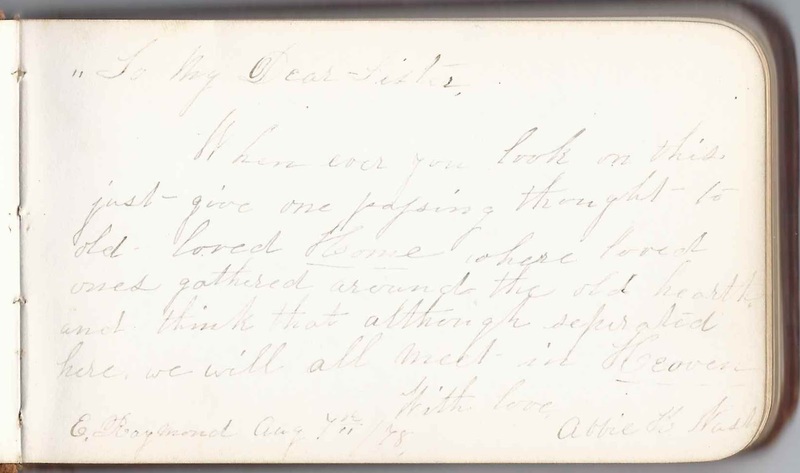 The album is approximately 5-1/4" x 3-1/4" and contains the sentiments of 27 of Eliza's relatives, in-laws and friends. An alphabetical list of the signers, including all supporting information and relationship to Eliza, appears at the end of this post. Please advise if you notice any mistakes, so that I can correct them. Eliza Knight (Hamlin) King was born 12 September 1843 at Sweden, Maine, daughter of John Hamlin and his second wife Caroline (Evans) Hamlin. John Hamlin's diaries, 1846-1871, are held at the George J. Mitchell Department of Special Collections and Archives at the Bowdoin College library at Brunswick, Maine. John's first wife was Caroline's older sister Mary (Evans) Hamlin, who died in 1839 after bearing five children, two of whom died young and two of whom died before their time. The Evans sisters were the daughters of Timothy and B. (Gamage) Evans. John and Caroline married 2 November 1840. In addition to Eliza, they had three other children, two of whom died in childhood. Eliza's full sister Abigail (Hamlin) Nash, wife of Samuel Burbank Nash, signed the first handwritten page in the album, at East Raymond, Maine, on August 7, 1878. Caroline (Evans) Hamlin died in 1850. John married Mary S. Rich on 14 January 1854 at Harrison, Maine. On 3 July 1872 Eliza married William Horatio King, son of Joseph Haven King and Lucy Russ (Clifford) King. William Horatio King was born 3 February 1845 at Paris, Maine. His mother Lucy signed a page in Eliza's album as L. R. King of South Paris, Maine, on September 12, 1878 and called herself "your mother". I hope they truly had a mother/daughter relationship. 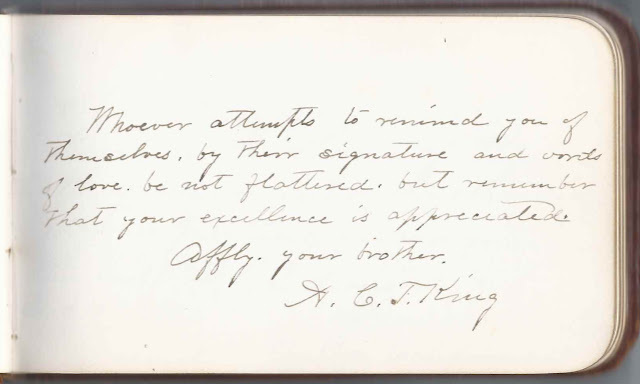 William Horatio King's brother, Abel Charles Thomas King, signed a page and called himself Eliza's brother. Mary Hamlin King, born 8 February 1882 at Concord, New Hampshire; in the 1900 Census, she was living with her mother's half sister Mary Elizabeth (Hamlin) Plummer and husband Samuel. Eliza Knight (Hamlin) King died 28 September 1894 at Sweden, Maine. Many other relatives and in-laws of Eliza Knight (Hamlin) King signed pages in her album; please refer to the list below. One interesting page, and the only page not signed in 1878, was that of Francis Hamlin, who signed his page on December 10, 1882, at Concord, New Hampshire, presumably at the home of William and Eliza, who lived at Concord during that time. Francis indicated he was Eliza's cousin and that his residence was Sutter County, California. Mary. Possibly Mary Elizabeth (Hamlin) Plummer, 3/4 sister to album owner Eliza Knight (Hamlin) King. Harriet N. Evans of Garland, Maine, presumably signed on August 24, 1878; shared the page with Daniel D. Knight and Abigail Eastman (Evans) Knight, sister of Harriet's late husband David Evans. Harriet's daughter with David, Hattie F. Evans, also signed a page in the album. John H. Evans of Sweden, Maine; John Henry Evans, son of James Evans, who was a brother of Abigail Eastman (Evans) Knight and Caroline (Evans) Hamlin, mother of album owner Eliza Knight (Hamlin) King. John Henry Evans' wife Lydia C. (Tucker) Evans also signed a page. 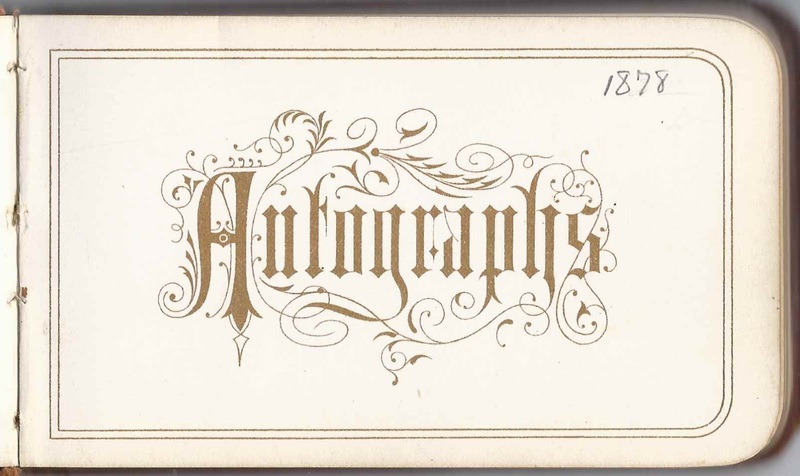 Lydia C. Evans of Sweden, Maine, signed on August 25, 1878; Lydia C. (Tucker) Evans, wife of signer John Henry Evans, son of James Evans, who was a brother of Caroline (Evans) Hamlin, mother of album owner Eliza Knight (Hamlin) King. Henry J. Evans of Sweden, Maine; presumably the son of signers Lydia C. (Tucker) Evans and John Henry Evans, who was the son of James Evans, a brother of Caroline (Evans) Hamlin, mother of album owner Eliza Knight (Hamlin) King. Hattie F. Evans of Garland, Maine, signed on August 25, 1878, daughter of Harriet N. (Foster) Evans and David Evans, who was the brother of Caroline (Evans) Hamlin, mother of album owner Eliza Knight (Hamlin) King. Hattie's mother Harriet N. (Foster) Evans signed a page shared with Daniel D. Knight and his wife Abigail Eastman (Evans) Knight. Sarah K. Flanders of South Paris, Maine, signed on September 13, 1878. She was Sarah Angelia (King) Flanders, wife of Roscoe Flanders and sister of William Horatio King, who was the husband of album owner Eliza Knight (Hamlin) King. 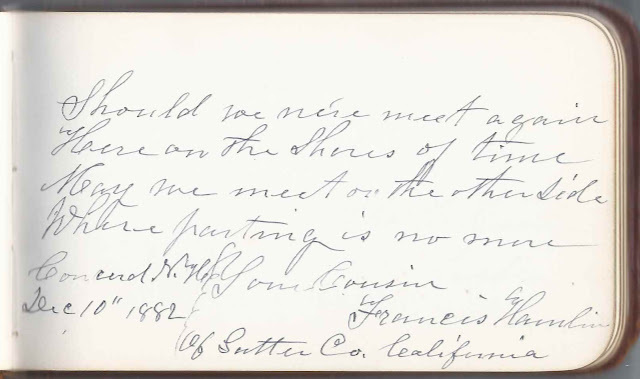 Francis Hamlin of Sutter County, California, signed at Concord, New Hampshire, on December 10, 1882; "your cousin"
Charles B. Hamlin of Sweden, Maine; cousin of Eliza Knight (Hamlin) King. Presumably the Charles B. Hamlin who was the son of Francis Hamlin, brother of John Hamlin, who was the father of album owner Eliza Knight (Hamlin) King. Vira B. Hamlin, signed at Sweden, Maine, on September 9, 1878. Presumably Elvira B. Hamlin, daughter of Betsey and Francis Hamlin, who was a brother of John Hamlin, father of album owner Eliza Knight (Hamlin) King. 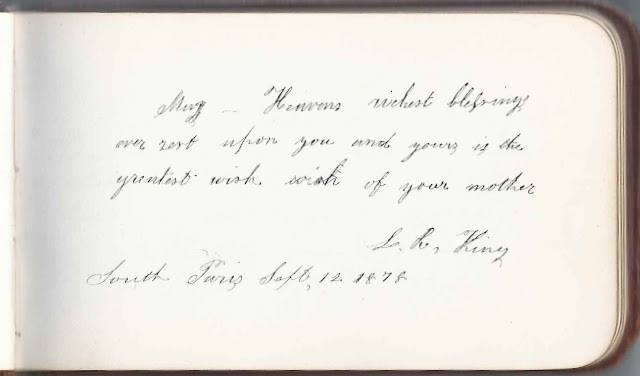 L. R. King, signed at South Paris, Maine, on September 12, 1878; "your mother". She was Lucy Russ (Clifford) King, mother of William Horatio King, husband of album owner Eliza Knight (Hamlin) King. A. C. T. King; "your brother". He was Abel Charles Thomas King, brother of William Horatio King, husband of album owner Eliza Knight (Hamlin) King. Daniel D. Knight, signed at Sweden, Maine, on August 24, 1878; shared the page with his wife Abigail Eastman (Evans) Knight and her sister-in-law Harriet N. (Foster) Evans, widow of Abigail's brother David Evans. Abigail Knight, signed at Sweden, Maine, on August 24, 1878; Abigail Eastman (Evans) Knight; shared the page with her husband Daniel D. Knight and Harriet N. (Foster) Evans, widow of Abigail's brother David Evans. Abigail Eastman (Evans) Knight and David Evans were siblings of Caroline Evans, mother of album owner Eliza Knight (Hamlin) King. Abbie H. Nash, signed at East Raymond, Maine, on August 7, 1878; "to My Dear Sister". She was Abigail (Hamlin) Nash, wife of Samuel Burbank Nash and sister of album owner Eliza Knight (Hamlin) King. J. Waldo Nash of Sweden, Maine, signed on September 18, 1878. John Waldo Nash, son of Samuel Burbank Nash and Abigail (Hamlin) Nash, sister of album owner Eliza Knight (Hamlin) King. Mary A. Plummer of Sweden, Maine, signed on September 6, 1878. Presumably Mary Ann Plummer, daughter of Samuel Plummer Jr., and his first wife Esther Elizabeth (Nevers) Plummer, who died in 1852. Samuel Plummer Jr.'s second wife, Mary Elizabeth (Hamlin) Plummer, was a 3/4 sister of album owner Eliza Knight (Hamlin) King. S. L. Plummer of Sweden, Maine, signed on September 18, 1878. Presumably Samuel Lyman Plummer, husband of Carrie M. (Stone) Plummer, who signed the right facing page. Album owner Eliza Knight (Hamlin) King was a 3/4 sister to the Mary Elizabeth (Hamlin) Plummer, second wife of Samuel Lyman Plummer's father Samuel Plummer, Jr. Samuel Lyman Plummer's mother was Esther Elizabeth (Nevers) Plummer, who died in 1852 when he was about two years of age. Carrie M. Plummer of Sweden, Maine, signed on September 18, 1878. She was Carrie M. (Stone) Plummer, wife of Samuel Lyman Plummer, who signed the left facing page. Mira K. Verrill of South Paris, Maine, signed on September 13, 1878; "your loving niece". She was the daughter of Leonard F. Verrill and Frances Maria (King) Verrill, who was a sister of William Horatio King, husband of album owner Eliza Knight (Hamlin) King. F. M. Verrill, signed on September 13, 1878. She was Frances Maria (King) Verrill, wife of signer Leonard F. Verrill. Frances' brother William Horatio King was married to album owner Eliza Knight (Hamlin) King. L. F. Verrill, signed at South Paris, Maine, on September 12, 1878. His wife was signer Frances Maria (King) Verrill, sister of William Horatio King, who was the husband of album owner Eliza Knight (Hamlin) King.